Peter and his grandpa’s miniature railway across the farm has been a lot of fun since they built it. Adventures, visits, races and near disasters have all been a part of the story so far. But now the farm is in the grip of the coldest winter for years. The tractor has frozen and the only way to feed the animals is by train. The technical aspects explained include: Snow plough; Ice and why it floats and bursts boilers; Electricity, lamps and switches; Watermill; Energy and power; Electric motor and generator; Driving a locomotive; Boiler and cylinders. Glossary of special words. 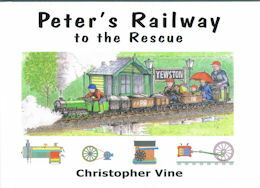 Hardback, 96 pages with 30 watercolour pictures. There are 14 pages of simple technical drawings to explain, add interest and answer questions.